I’ve been blogging about my recent trip to Fiji on Fiji Guide–a trusted source on all things Fiji–so hop on over and check it out. 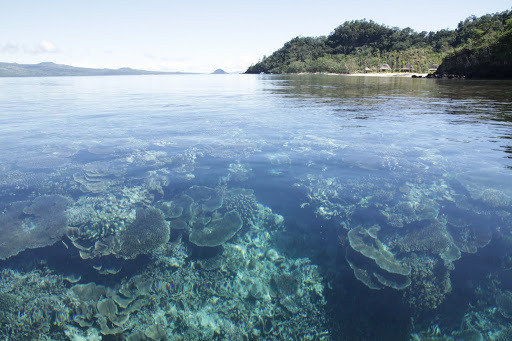 So far I’ve covered my arrival and posted photos of the land and sea creatures I encountered there (grr…if only I’d thought to bring an underwater camera), both in the Mamanucas and on Taveuni. Here’s a sneak peek, but head here for the full story. ps: Fiji Me is Fiji’s tourism slogan. Wonder what a similar one for Hawaii would be? The last two books I read were “Mindset: The New Psychology of Success” by Carol Dweck. She’s a Stanford professor and has done 20 years of mindsets research and has come up with two: a growth mindset, about learning and being responsible for what you learn and what your success is or isn’t, and a fixed mindset, which is ability-based, not wanting to take risks for fear you might undermine the perception that you’re successful and competent. I found it very engaging and relevant to educators and parents, to anyone working with other people, to anyone looking at him or herself related to self-perception and well being. I found it a very good read. Both books were recommended to me by friends. “Mindset” more because I’m the chair of the National Association of Independent Schools board, so the CEO of the organization recommended it to all of us as board members, and then we had a conversation with Carol Dweck on one occasion. It was everything it was purported to be and more. -What did you take from it? I think it had relevance for anybody who is trying to develop young people and or work with adults in terms of trying to develop productive and positive mindsets for life. Again it’s never 100%–the two mindsets, fixed and growth, are two ends of a continuum so there’s a lot of grey area between the two. But it gives one a hook or benchmark in terms of how to react to life situations. For instance, when you’re talking with your child and say the child gets an A—it’s better to say ‘wow, congratulations, you did everything you needed to do to get a high mark—you earned it,’ rather than ‘wow, you’re smart.’ Both reactions to the same success have a different meaning for the child. One says it was caused by my work and I take full responsibility for the actions that led to that success, and the other was I was born into this situation and circumstance. -How does reading about reacting to life’s challenges influence how you prepare students for the future? -So do you focus most on exposing students to different experiences, like with Iolani’s new online eSchool? Professionally it’s important to continue to look for ways to benefit Iolani kids as well as the broader community. The stature of the institution in the community obligates us to look for ways to serve the broader community in different ways and not just be insular and serve our students. Something like the eSchool was intended to break out and expand our constituency and leverage the expertise that we’ve developed, so others could benefit from it. It’s important that we look at not only improving Iolani School, and that requires us to do things differently. So that’s some of what attracts me in my reading. Currently I have two books going. One is titled Encore: Finding Work that Matters in the Second Half of Life by Mark Freedman, and it’s about baby-boomers retiring and finding work that matters and finding work that matters in the second half of their life. I’m actually reading it with several other people who run non-profits about how the workforce is going to be changed—looking at possibilities for individuals but all also for companies. Every so often I get to read fiction so I’m reading a book called “Aloft” by Chang Rae Lee—it’s a book in common we’re reading with the English Department here, and it’s about a guy living in the suburbs of Long Island in a middle-age crisis. So a lot of adult males will relate to this. There’s also a book called “A Whole New Mind: Why Right-Brainers Will Rule the Future” by Daniel Pink and in it he talks about the rise of right brain thinkers–looking at patterns and systems and nuances—those are not usually the skills awarded in schools. And then over the summer “The Audacity of Hope: Thoughts on Reclaiming the American Dream” by Barack Obama. It’s been on my bookshelf for a couple of years and I finally got around to it. And a book called “Moneyball: The Art of Winning an Unfair Game” by Michael Lewis. On the surface it’s a baseball book. It’s fun for me as a former baseball player, but it’s a new way of evaluating talent, or people resources. -Where did you discover it? When we new that [Lee] was coming I wanted to read his books. When I first met him at Princeton a year ago he gave me the book “Aloft” personally with his signature so I felt I needed to read it before he came. And “Encore” was sent to me by Robert Witt who is the head of the Hawai`i Associate of Independent Schools—we’re just reading it with a group of school heads and nonprofits. 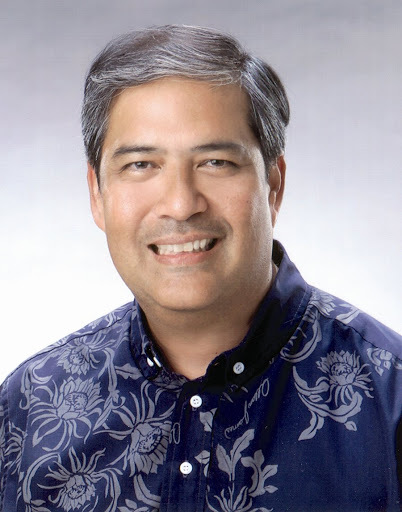 And the other person who recommended it was Calvin Takeda who is the head of the Hawai`i Community Foundation, and former head of The Nature Conservancy. -What do you like about Freedman’s and Lee’s books? “Encore” is just giving me a different way to view the demographic transitions in the faculty. So what’s happening for us in schools with the retirement of the baby boomers is you have this massive teacher shortage that’s upon us. This has given me ways to reframe this—maybe some of those baby boomers will be working longer but in a different way through mentoring or other ways. For those who are retiring it’s a way to reframe retirement. And most of my reading list is nonfiction so “Aloft” is a nice treat. -Do these stories about people in transition help you envision how Punahou students and faculty can model and promote environmental sustainability? I think 80 percent of our budget is the people costs of running the organization. And 80 percent of my time is filled with people issues. In my position I have to rise above the day-to-day and think more strategically and creatively about the issues, and as I do I can h elp force other people to do the same. I think even though sustainability is a thrust for us, something like “A Whole New Mind” actually fits into that. We’re trying not just to change kids’ behavior, but for them to see systems and the interdependence of systems and for them to become not just recyclers but more inventive and innovative and resourceful about how they might do things differently. We’re producing the next generation of change agents not just the next generation of consumers. If we can get from a 5-year-old to an 18-year-old to a 50-year-old faculty member to think about the interdependence of systems then you’re really changing how people conceptualize the world. When asked what they like to read, many people respond simply, I just want a great story. Knowing a great story when you read one is easy, but writing one can be elusive. Though primarily a story consultant for Hollywood scripts, John Truby’s new guide to storytelling, The Anatomy of Story: 22 Steps to Becoming a Master Storyteller, has value for any storyteller, screenwriter and novelist alike. Practical but not dumbed-down, Truby breaks down classic films and novels such as Chinatown and The Great Gatsby, to explore plot and premise, theme, character, moral development, and endings that refuse to let the reader go. With such specific exercises and points of reference, literature instructors–especially at the high school level–could also benefit from using this guide with students. 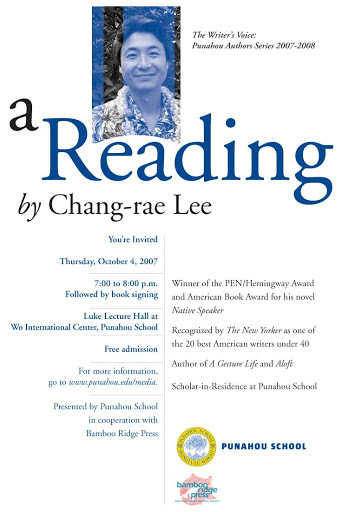 The first in a new reading series called The Writer’s Voice, Punahou School’s scholar-in-residence Chang-rae Lee will give a reading Thursday October 4, 7-8 pm, at the Luke Lecture Hall in the Wo International Center on the Punahou campus. A recipient of the PEN/Hemingway Award and American Book Award for his novel “Native Speaker,” Lee is taking a break from his teaching work at Princeton, working instead with would-be writers and students of literature at Punahou’s Academy. Next up, on November 15 local writer Cathy Song (Picture Bride) will read from her new book.